MacBook - Thinner takes all. Our goal with MacBook was to do the impossible: engineer a full‑size experience into the thinnest, lightest Mac notebook yet. And not only is it compact — it’s more powerful than ever. 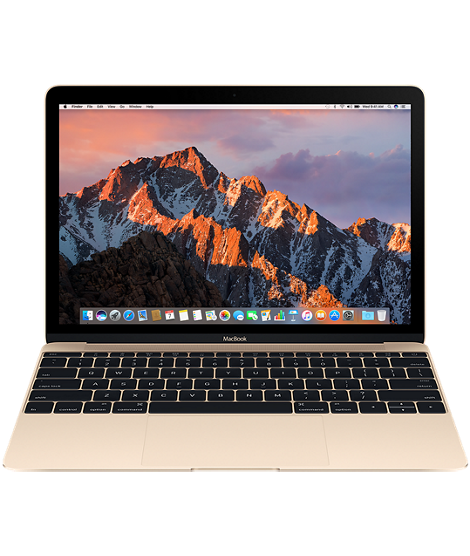 The new MacBook delivers up to 20 per cent faster performance with new seventh‑generation Intel Core m3, i5 and i7 processors,1 and up to 50 per cent faster SSD storage. We squeezed the most into it.And out of it. Inside you’ll find seventh-generation Intel Core m3, i5 and i7 processors with 14-nanometre process technology. This lets MacBook expertly combine energy efficiency with the performance needed to take on all sorts of tasks. The Force Touch trackpad.Press a little deeper, do a lot more. The USB-C port puts everything you need in a port all in one place. It provides charging, speedy USB data transfer (up to 5 Gbps), and video output in a reversible design that’s one-third the size of a USB 3 port, giving you the flexibility to easily connect your favourite devices.